Twenty-five years ago tomorrow, I discovered my first new species. I didn’t know it at the time – in fact, it would be several years later before the budding, young entomologist that I was would finally conclude that the large, spectacularly beautiful, cerambycid beetle that I was capturing in my fermenting bait traps just south of St. Louis did indeed represent a previously unrecognized species. In my first job out of school as a field entomologist for the Missouri Department of Agriculture, I worked with nursery growers to identify insect pest problems on their crops and provide recommendations for control. Wood boring beetles – especially the longhorned beetles – are a major problem for growers of trees, and it was that importance, combined with a latent interest in taxonomy, that led to my interest in this group (and the beginnings of my identity as a “coleopterist”). I didn’t just work in entomology – I lived it, and when I wasn’t inspecting rows of trees, checking gypsy moth traps, or scouting for musk thistle weevil release sites in the three counties around St. Louis, I was collecting insects and the primary literature about them. One of the early papers I came across (Champlain and Knull 1932) described the use of fermenting bait traps for collecting Cerambycidae, in particular species in the genus Purpuricenus. I desperately wanted some of these beetles – large, showy, velvety black, with vivid red or orange basal markings on the elytra – but had not yet encountered either of the two species then known in eastern North America. I made a batch of the stuff – basically molasses, beer, yeast, and water – and placed buckets of the slurry at a few spots that I would be able to check periodically while on my rounds. Much to my delight, I quickly began trapping numerous species of Cerambycidae – including the two species of Purpuricenus. Most of these specimens were coming to a trap I had placed at one of my favorite collecting spots – Victoria Glades Natural Area in Jefferson Co., some 30 miles south of St. Louis. Over the next few weeks I acquired a nice little series of the two species, and I increased their number during the following three years with continued trapping. The two species were easily distinguished – in Purpuricenus humeralis the basal elytral markings were triangular and covered just the humeri, while in P. axillaris they were transverse and covered the entire basal half of the elytra. As I studied the series of the latter, however, something seemed amiss. Some of the specimens were distinctly larger and more robust, while others were smaller and more gracile. Moreover, the color of the elytral markings on the larger specimens seemed to be consistently more reddish than the pale orange markings of the smaller specimens. At first I dismissed it as variation – common among longhorned beetles, which can vary greatly in size depending on the quality of the larval host. But as I studied them more I noted other consistent differences between the two “forms” – the larger with more well-developed pronotal tubercles (the middle one of which bore a distinctly polished apex and the lateral ones more acutely angled), a distinct “tooth” at the apex of the elytral midline, and coarser punctures at the base of the elytra. It seemed obvious that the two forms represented two different species, but the only other species I could find in Linsley’s (1962) monograph of North American Cerambycidae (my bible!) was P. linsleyi – known then only by the holotype and one paratype from an unspecified location in Texas. Neither series matched the description of that species very well – the shape of the elytral marking was wrong – but I concluded the larger one must be that species and the smaller was axillaris. There was another possibility – but that young entomologist just couldn’t entertain the idea of a large, showy, longhorned beetle still undescribed in eastern North America. Some time later I received a series of a Purpuricenus that my colleague Dan Heffern had collected near San Antonio, Texas. Dan had also taken up collecting cerambycids with fermenting bait traps, and while he was quite proficient with Texas species he wasn’t quite sure what to make of these particular specimens. He sent them to me for my opinion, and it was quite clear – they were the real P. linsleyi. The rediscovery of that rare species was an exciting find in itself, but it rekindled the puzzle of the Missouri Purpuricenus – if they were not P. linsleyi, then what were they? The only conclusion was that two species were masquerading under a single name, and that I would have the privilege of naming one of them. Wow, my first new species – something every amateur taxonomist dreams about, but I had no idea it would happen so soon, or with such a spectacularly beautiful species! By then I was living in Sacramento, so I traveled to nearby Berkeley to meet with the late John Chemsak at the University of California and show him my material. John was a longtime associate of the late, great E. Gorton Linsley, co-authoring with Linsley several later volumes of the North American Cerambycidae monograph, and had managed to borrow type material of P. axillaris from the Museum of Comparative Zoology at Harvard University. We found that both species were present in the small type series, so together we decided which specimen should be designated as a lectotype for P. axillaris – and thus, which of the two species would be named as new. It would take several more years before I actually published a description of the new species, naming it P. paraxillaris (meaning “near” axillaris) and selecting as holotype the very first specimen I collected – on June 25, 1984. I wanted to know its distribution, which meant borrowing material from museums and willing individuals. I also recognized that some collectors of Cerambycidae might view the description of a large, showy species from eastern North America with some skepticism, so I wanted to be as thorough as possible. (There were a few private collectors that declined to loan their material to me because of such skepticism.) During that process, I learned that P. paraxillaris is quite common across the eastern U.S. – in fact, many of the literature references to P. axillaris actually refer to this species, but it wasn’t until collectors began using fermenting bait traps widely that large series of specimens became available for study. By examining the few available reared specimens, I learned that P. axillaris prefers hickory (Carya) as a host, while P. paraxillaris prefers oak (Quercus) and chestnut (Castanea). With several hundred specimens of the two species at my disposal, I became more convinced than ever that they were distinct, and with the many specimens of other species in the genus that I had borrowed as well, I decided to expand the scope of the paper to a general review of the entire genus in North America. This would allow me not only to describe the new species, but report the rediscovery of P. linsleyi as well. Finally, after several years (remember, I was/am just an amateur), the description was published in the October 2000 issue of The Pan-Pacific Entomologist (MacRae 2000). For those of you with an interest in such things, I include here a key to the three eastern North American species of Purpuricenus. Champlain, A. B. and J. N. Knull. 1932. Fermenting bait traps for trapping Elateridae and Cerambycidae (Coleop.). Entomological News 43:253–257. 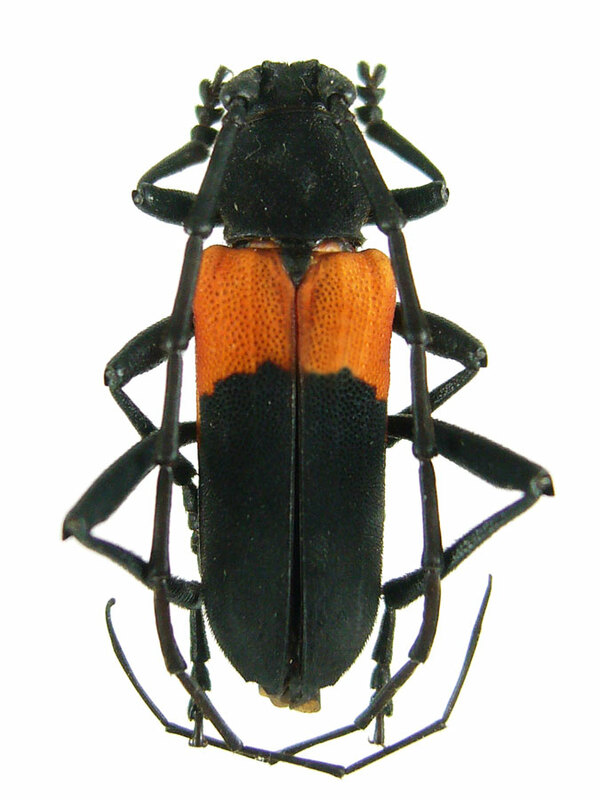 MacRae, T. C. 2000. Review of the genus Purpuricenus Dejean (Coleoptera: Cerambycidae) in North America. The Pan-Pacific Entomologist 76:137–169. This entry was posted in Cerambycidae, Coleoptera and tagged beetles, entomology, insects, longhorned beetles, nature, new species, science, taxonomy. Bookmark the permalink. There are several entomologists – whom I considered giants in the field – that took the time to indulge my budding interest. Their willingness to look at my specimens and answer my incessant questions was a tremendous help for me. In whatever small way I can, I try to emulate their generosity with those who show a similar interest. You are one of those people, and I do hope I get the chance to return to South Africa some day. A great start to your career. Congratulations on your anniversary! Thanks Adrian. Hard to believe it’s been that long ago now! You’ve distilled the process – from that first, usually somewhat annoying inkling that something isn’t quite right, to the OMG I’m going to have to revise the entire genus! – very well. The amount of work it takes to describe a new species well is seldom appreciated by the other disciplines that taxonomy serves. I’ll be recommending this post to my more oblivious ecologist friends. Amazing that such a large and colourful beetle managed to hide for so long and congratulations to you for discovering it. Hi HBG – it didn’t strike me until your comment that I basically had distilled the process of describing a new species. There’s always a more interesting story behind the description than what appears in print. I appreciate your recommending this post to others. I believe it was the historical rarity of these two similar appearing species that prevented their being distinguished earlier. Only when large series started becoming available from bait trapping did the differences between the two species become apparent. I can only claim credit for being at the right place at the right time. That is a wonderful story of your discovery so long ago. The effort and patience it took must have been incredible- but your love for entomology shines through. Our lives are marked by special moments- thanks for sharing one of yours. Thanks Beau – glad you enjoyed it. Congrats Ted. What an amazing beetle! Hope you have time to celebrate. Thanks Clay. Every day I get to work with bugs is a celebration! Wow, congrats, Ted. Always nice to hear the human story behind a scientific discovery. Thanks Alex! It’s a shame the human stories behind the science are so often lost. Happy Anniversary to you. I lift a cup of fermenting beetle juice to you and your beetle! I recently found what I believe to be the Purpuricenus humeralis (Fabricius, 1798) beetle, but it was down in Texas near a location called the Devil’s watering hole, Inks lake. So far I can only find references to it being found in North eastern america. Do you know of any other locations it has been found in? Thank you. Purpuricenus humeralis has been recorded from notheastern North America as far south and west as Oklahoma. It is not currently known from Texas. Maybe what you found is P. linsleyi? That species is known from the hill country of Texas and can sometimes be confused with P. humeralis. I would love to know more about the location and possibly get ahold of specimens from there. You can send me an e-mail through the “Email Me!” link up top.